In my role as a divorce litigation consultant, I work with both moms and dads as they navigate the often unpredictable and frequently heartbreaking road of custody litigation and post-divorce co-parenting. Since two of three divorces are low conflict, my career has been spent dealing with the small group of high-conflict divorces—some of the one third of divorcing couples that just can’t agree on what’s best for their children during and after divorce. As mediation has become the standard pre-trial procedure in Texas, the number of litigated custody cases going all way to a jury verdict is down to about 1% of all cases—a trend that’s good for every child of divorce (and their parents, too). 2. The simultaneous increase in a subtle but pernicious bias against how fathers parent their children, whether they are the primary parent or have various ranges of visitation rights. First, as I have written elsewhere, the actual numbers of “parental alienation” cases is very low—a tiny fraction of those high conflict divorces I mentioned above. And the best available research looking at more than 1000 of those cases revealed that when mom alleges abuse, 50-70% of those allegationswere proven to be true in the courtroom, and intentionally false allegations made by mothers were exceedingly rare. 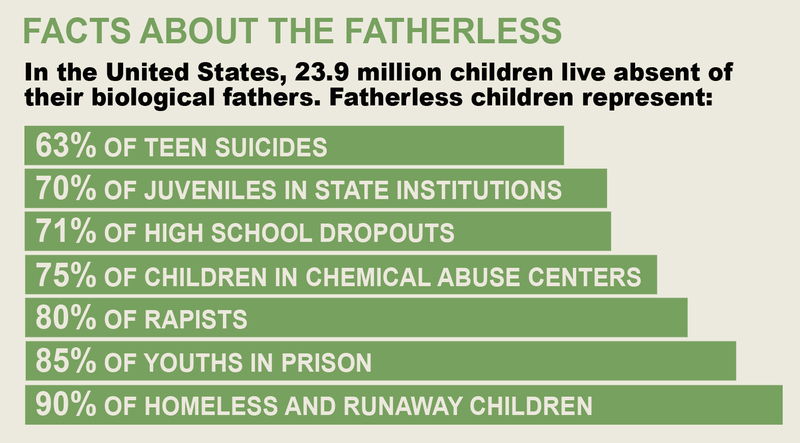 Interestingly, the largest source of FALSE allegations was made by non-custodial fathers. The danger to the children (and to the family court system) is that once the allegation of “parental alienation” is made, the burden of proof (real not legal) falls on the accused parent to prove the negative “I am not an alienator!”. Just as in the Salem witch trials, where innocence was established when the “witch” drowned during repeated dunkings, ALL attempts by the alleged “alienator” to establish her innocence are interpreted as further evidence of her guilt! (She didn’t drown, she must be a witch; she denies it, she must be an “alienator”). This toxic labeling is frequently given unwarranted credence by uninformed or poorly professionalized mental health professionals who jump on the unproven and statistically unlikely band wagon, even though the APA refused to include “parental alienation” as a diagnosis in DSM-V because of a lack of valid and reliable criteria! Based on my experience in more than 1000 contested cases, “alienation” is family dynamic/pattern, not a personality disorder, and should be treated as a symptom of the dysfunctional family system (these parents are divorced or divorcing after all), and NOT attributed to one parent. BTW based on my review of the research, there is NO evidence supporting the forced removal of the children from the “alienating” parent and moving the children to the home or primary conservatorship of the other parent, and much data on attachment, bonding, and childhood stress to suggest that such a “solution” is harmful to children and unhelpful in resolving the underlying parental conflict. 2. The failure to fully appreciate a father’s role in a healthy family, the difference in how men form and maintain relationships, and a resulting denigration of a father’s contribution to the development of his children by divorcing moms and sometimes, by family courts. As I have noted elsewhere, there has been a remarkable lack of research into the role of fathers in normal children’s development until the last 30 years or so. Maternal-child bonding-attachment has been investigated for nearly 100 years but there has been little attention given to father-child bonding-attachment. Recent research, especially advances in brain imaging, have opened the door to the importance of the father’s unique contribution to the health development of children—beginning at birth! When fathers are engaged in holding, feeding, changing, talking to, and swinging babies around (as only fathers do), there are positive, identifiable changes in the brain structure and development of these fortunate children, and concurrent identifiable neurotransmitter and hormonal changes in dad as well. Dads and kids develop neurochemical “attunement” over their time together, and this attunement is reflected in positive parent-child relationships later in both their lives. On the other hand, too many dads are opting out of being fully engaged dads, beginning at birth. Their own family histories, extreme attitudes about traditional family roles, economic/career pressures to work long hours, narcissistic personality features--whatever the reason--about 1 in 4 dads apparently are NOT bonding to their children through early, frequent engagement with their babies and toddlers, and consequently, both they and their children are missing out on the benefits of the potential attunement to each other. This failure of dads to be engaged with their babies is a warning sign of marital problems occurring at the time or coming later. Disagreements about how to raise children are a major cause of divorce in young parents, and these dads who have not been involved in caring for their young children are likely to be clueless when they have a whole weekend of visitation with children they barely know or know how to care for. They are not closely bonded to their children, and their children may not be securely attached to them either. This attunement failure can lead to challenging visits for both dad and the kids, and if not remedied by giving good information and training to dad, to children resisting visitation with a parent they don't trust. When this happens to a dad with narcissistic features, the resulting insult to the image of a "perfect" dad can lead to accusations that the mom is "poisoning" the children, "otherwise why wouldn't they want to be with a guy as wonderful as I am". It may also contribute to the alarming number of dads who completely bail after divorce (particularly after re-marriage-more about this below). On the other hand, for dads who have been fully engaged from the children's birth in caretaking and parenting, unresolved marital conflict and parental hostility can lead to "Disneyland dad" allegations by mom. Dad may not have daily contact or caretaking responsibilities and spends his weekend visits doing fun, active, sports or recreational activities with the kids. In healthy families, it's what dads do. In contrast to women, who make and maintain relationships by talking; men make and maintain relationships by doing things together. Children need two parents who can provide both kinds of relating in order to develop normally. Unfortunately, in the family court, even an engaged dad can find that his relationship style and contribution to his children's development is frequently not appreciated or inappropriately criticized as "not in the best interest of the children." This failure to appreciate dad's different contribution to parenting can lead to less access and visitation for dad, and a loss of needed father contact for the children. We all need dads to stay engaged with their children, not just for them, but for all of us. 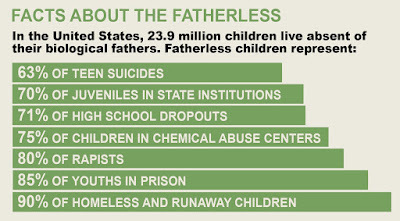 As you can see, fatherless children are at the root of some of our more serious and costly social problems. This is a problem that crosses racial, ethnic, and economic boundaries, and costs all of us more $700 Billion a year in services, facilities, and lost tax dollars. 1. Continue to encourage the growth of collaborative divorce which early data suggests lessens ongoing family conflict post-divorce. 3. Recognize and respect the complimentary but different contributions that moms and dads make to the development of healthy children, especially in divorce. 4. Fatherless kids need mentors when they don't have dads; support and participate in mentoring programs for fatherless kids.